Alan Martin and Rufus Dayglo (pictured), creators of Tank Girl Skidmarks, will be signing Skidmarks #2 at the Forbidden Planet Megastore, 179 Shaftesbury Avenue, London, WC2H 8JR, on Saturday 5th December 1 - 2pm. Alan and artist Jamie Hewlett created Tank Girl in 1988 for Deadline magazine. Their anarchic heroine is now a cult icon that has given us strips, monthly comics, graphic novels, prose novels and a Hollywood movie. Rufus Dayglo is now working with Alan on Skidmarks - a riotous, all-new Tank Girl mini-series. Skidmarks is set in Australia in the near future: a post-apocalyptic, but still rather picturesque wasteland. The former bounty hunter turned outlaw known as Tank Girl spends her days drinking, fighting and getting up to all manner of mischief - until she's forced to give up her life of semi-retirement and climb back into the saddle to save the life of her best friend, Barney. This is everything you ever wanted to know about Tank Girl’s schooldays – and everything you didn’t! Continuing 'British Mavericks' month on the Strip!, broadcast on ResonanceFM, Alex Fitch looks at the new charity anthology: "Ctrl Alt Shift unmasks corruption", a collection of short comic strips that mixes seasoned professionals with the work of small press artists and creators from other media who are less well known for working in comics. From the latter group, Alex is talking to Dev Hynes*, better known as the musician Lightspeed Champion, who has a sincere interest in comics that led to the creation of two strips in the anthology. We also missed out on reporting on some recent podcasts: of note to downthetubes fans is Panel Borders: Doctor Who and The Spiral Cage, continuing a month look long at ‘British Mavericks’ – interviews with artists whose work brings aspects of the avant-garde to mainstream comics. • Leonie O'Moore, Tony Hitchman and WJC from the "New British Comics" anthology will be present at Thought Bubble convention (Saturday, November 21st) and they will be happy to sign your NBC copies. Signing will be available throughout pretty much whole day - you can leave a book on Leonie's Moore stall and pick it up later when it will be signed for you. Also, both issues of NBC should be available for purchase at Smallzone stall during the convention. • Talking of Thought Bubble, 'Possibilities and Perspectives: A Conference on Comics', an academic event, is also coming up in Leeds this weekend. Tickets are £8 and include entry to the conference and the Thought Bubble Festival's one day comic convention. The conference will take place at the Alea Casino in Leeds, near the Royal Armouries (a 30 second walk from the Thought Bubble Convention venue, Saviles Hall). For a map and directions, visit: www.aleacasinos.com/alea/leeds/location.php. The event includes a Keynote Speech from Bryan Talbot on "The Use of Style and Storytelling Techniques in The Tale of One Bad Rat". • Eden Court Theatre in Inverness will play host to the third HiEx International Comic Convention on the 27th-28th March 2010. “The first two years where such a success that we really had no choice but to do it again," explained organiser Vicky Stonebridge. Co-organiser Richmond Clements adds: "We have some very exciting guests already confirmed- among them the incredible John Higgins, Gary Erskine, Colin MacNeil, Asia Alfasi, Alan Grant. Many more artists and writers will be coming along, as well as the popular stormtroopers from the 501st UK garrison. Keep checking the HiEx website, (www.hi-ex.co.uk) as we’re adding all the time." Over the course of the weekend, visitors can expect a range of events. “Our children’s workshops have proved to be very popular, and we’re planning to run even more of them this time around," Vicky said. "There will also be workshops for both art and writing, for adults. Tickets go on sale soon, with a special discount for early booking through the HiEx website. • After 18 months, many conventions and quite a few web sales UK indi publisher CD24 is finally down to the last few issues of Last of the Chickenheads issues 1 and 2, and Crowman issue 1. As in the future they're going to be concentrating on publishing graphic novels, they’ve decided to host a quick fire sale and are offering them for £1 an issue. So this is your final chance to get your hands on these titles in the single issue format as once the only way you'll be able to get them is in a graphic novel format (at some point in the future). • Anyone wanting to purchase these issues, or Jack in the Box, can get them at www.c2d4.com. Win a PSP 3000 thanks to the Geeks! To celebrate the launch of the Sony Digital Comic Store, top British comics and SF news site Geek Syndicate has teamed up with Sony and Insomnia Publications - publishers of titles such as Cages, Cancertown and Burke and Hare - to bring you an awesome competition to win a Sony PSP 3000 supplied by Sony. The PSP 3000 will come with the a selection of graphic novels provided by Insomnia Publications, who are one of the first British publishers on board to take advantage of this latest digital comics delivery platform. To be in with a chance to win all you need to do is send the Geeks an email with the title “Going digital with Geek Syndicate, Insomnia and Sony!” to geeksyndicate@hotmail.co.uk. The first entry they pull out of the hat will win. The closing date for entry is 1st December. For folks heading to the Thought Bubble convention in Leeds this weekend you can enter by heading over to the Insomnia Publications stand and filling in an entry form. Please note, this competition is only open to entrants who are 18 or over and have a UK Postal address. The new Digital Reader on PSP kicks off Sony's Digital Comics service, with the company proclaiming it will revolutionise the way you read and open up a whole range of media to your fingertips. Sony's Digital Reader service will start with Digital Comics in December 2009, offering a brand new way to read comic books via a huge library of digital comics you can download from PlayStation Store to your PSP – both classic and new comic titles. The new service will offer content from Marvel Entertainment and IDW Publishing, as well as graphic novels and comics from a variety of local publishers and the latest underground sensations such as Insomnia. who will have books in the Sony Playstation Networks Digital Comics store when it launches in December. More titles will arrive on PlayStation Store with monthly content updates, offering a huge choice of quality titles at your fingertips, allowing you to take your favourite comic characters with you on the move. "This is a great new service that offers PSP owners even more options for entertainment on the go and makes PSP a must for comics fans,” says Isabelle Tomatis, European Marketing Manager, Hardware and Platforms, Sony Computer Entertainment Europe. "We are incredibly excited to be partnering with Sony in the launch of the Digital Comics Service," says Crawford Coutts, Managing Director of Insomnia Publications. "Insomnia is committed to nurturing the very best new art, new writing and new concepts in its original graphic novels and the unprecedented scope of this Comics Store will connect independent publishers and readers around the globe." US e-publisher Underwater Samurai Studios Publishing have just released their first made for digital comic, Soldiers Zero, utilising technology developed by Irish iphone comics makers Infurious Republic, the creators of digital titles such as Beatnik High and the controversial Murderdrome, which was created by PJ Holden and Al Ewing. Written by Rob McClellan with art by Martin Montiel (The Darkness, Legendary), Chris Summers (G.I. Joe) and Charles Pritchett (Noble Causes), the first issue of Soldiers Zero follows the exploits of four prototype super-soldiers deployed to Afghanistan in August 2007, and the tragedy that befalls them. UWS say the great-looking adventure strip, which runs to 185 screens and costs just 99 cents, is the start of an ongoing digital comic series made exclusively for the digital market, and the first salvo in a bold digital publishing agenda. Back in January, Rob McClellan, who is a US naval officer, and his two partners Tim Welch and Tom James, formed UWS Publishing to produce content primarily for digital devices, a drastic departure from the current approach to publishing. "People keep telling me that comics can only make money in print, but there are over five million iPhones out there being used every day," says McClellan. "Even a quarter of a percent of iphone market share is 12,500 downloads – that's much better than most books by small publishers would ever do in print." While the digital comic market is something now finally being embraced by large publishers such as Marvel, Rob feels there are opportunities for strong independent titles on mobile. To provide that quality experience, the UWS team felt it was imperative that the app perfectly synchronize with the book and, after a lengthy search, the right comic book app materialized from a small, Irish software company, Infurious Republic, the team behind Infurious Comics. Over Skype, Rob and Philip Orr, the CEO of Infurious Republic, hammered out the details and, three prototypes later, settled on the app for Soldiers. The final result, feel the UWS team, is a digital comic experience unlike anything else currently on the market. The navigation method for the Soldiers app is a simple tap on the far right or left sides of the screen and the word balloons can be removed to allow for better appreciation of the artwork. The reader can also quickly access "visual scrolling", a unique feature which yields fast, accurate navigation through the issue's 185 screens of content. Screen advances are quick, but subtle. The effect is a surprisingly easy and effortless read. "Going digital required thinking a little differently," says McClellan. "There are a lot of differences between digital and print. We made Soldiers around those differences, fully accepting them and the result is a comic that feels organic to the device. "I think it will change how people look at digital comics." At a time when more and more books are gravitating to large Digital Comic Distributors such as iVerse and Comixology, Soldiers stands on its own. "We felt that putting the book behind an "in-app" purchasing application added another barrier for readers to get to our comic," says Rob. "Anyone can search for Soldiers in the app store, or link directly to it and share via blogs, e-mail, Twitter, and Facebook. We wanted to be able to capitalize on the impulse buy nature of digital." • Buy Soldiers on iTunes via this link, or search iTunes for “soldiers zero”. Continuing our series of interviews with British comic convention organisers, for this ninth – and for now, final – instalment Matthew Badham talks to Lisa Wood of Leeds' Thought Bubble Festival. Thought Bubble is a four-day annual event which celebrates sequential art in all its forms, including everything from superheroes to independent small press. We are a non-profit making organisation dedicated to promoting comics and graphic novels as an important cultural art form. Taking place at a variety of venues across the city, our aim is to cater to both long-time comic book fans and those who have never picked up a graphic novel before! Thought Bubble will take place next weekend, 19th - 22nd November 2009 with a centrepiece one-day convention on Saturday 21st. downthetubes: Please tell us about a little about the history of your event. Lisa: Thought Bubble started in 2007. I had been toying with the idea of running some kind of comics based exhibition or a series of workshops and the idea grew from there. I was really keen to bring a comics festival to the UK that was in the same vain as some of the European festivals; something that wasn't just a convention but a celebration of comics on lots of different levels. I feel really passionately that comics should be recognized as a valid art form like in France, when they are called the ninth art and regarded very highly. The public's perception of comics and graphic novels is changing at the moment due to the popularity of comics-based movies. We are not only seeing superhero comic movies at the moment but films such as Road to Perdition, Scott Pilgrim and History of Violence too, which are all based on great graphic novels. Lisa: Thought Bubble is funded by Ticket sales and exhibitors. We have also just found out that we have Arts Council funding which is amazing! It is great to know serious funding bodies such as The Arts Council are recognizing the benefits of comic books for learning and literacy. Hopefully this is the beginning of something really special. downthetubes: What are Thought Bubble’s overall aims? Lisa: Our aim has always been to bring comics and graphic novels to the mainstream, and to show they can be an excellent educational tool to be embraced by libraries, schools and local councils. We want to put on a great show celebrating the amazing art and writing in comics. downthetubes: Who is Thought Bubble aimed at? What sort of punters do you hope to attract? Are you family-friendly? Lisa: We are very family-friendly. We pretty much aim the con at everyone! We try and programme events that will appeal to all ages and types. At our Alea event we host panels, screenings and talks, which are for adults. However, we also run lots of workshops and events especially for young people! We recognise the importance of introducing young people to comic books so the art form can keep growing and growing. Lisa: Because we run as part of the Leeds International Film Festival, we tend to get a wide range of people attending our events. We also tend to get people coming along who are just curious, which is great for us because we have the chance to introduce newcomers to this wonderful art-form, this is what we always intended to do. downthetubes: Can you give a projected (or actual) attendance figure for the Thought Bubble? Lisa: Figures for our festival and one day convention were: first year convention 500, festival as a whole 1100, our second year convention was 1500, festival as a whole 2500 and we are hoping this year will be 2200 for our convention and 3000 for our festival as a whole. downthetubes: What lessons have you learned during your time running Thought Bubble, in terms of its marketing and advertising? Lisa: I think we are still learning how best to approach these areas. We will probably concentrate more on online advertising this year rather than printed matter, just because costs can be so high. The way we have approached this in the past is where possible find in-kind sponsorship. We have worked with various magazines to promote ourselves and in return we have helped promote them. We also work with various shops around West Yorkshire to promote our event as much as possible. Getting people on board to help us spread the word and our brand is invaluable. downthetubes: Do you use emerging technologies to spread the word about Thought Bubble? Do you have a website or blog, or use email mailing lists? Lisa: We're really into using social networking sites to spread the word. We have also set up a Youtube account, where we can post our favourite clips and hold competitions. We also have a Wordpress blog that is updated daily at the moment. Our next goal is to record all of our workshops and talks to build up an online library of educational information for anyone and everyone to access. Lisa: Because these cost tend to be fairly high we try and avoid buying adverts in magazines and work on in-kind deals, as I mentioned before. downthetubes: What’s the mix in terms of exhibitors at Thought Bubble? Do you even have exhibitors? Lisa: We have over 170 exhibitors. The mix is usually, small press 50 per cent, guests and pros 20 per cent and retailers 30 per cent. It changes year on year though. downthetubes: What are your thoughts on the small press comics scene in this country? How do you use Thought Bubble to support it (do you try and support it)? Lisa: We absolutely support the small press scene. We love it! We hold weekly small press features on our blog, highlighting some of our favourite small press people. downthetubes: How much are the tickets for Thought Bubble? How did you arrive at that price? Please tell us about any concessions. Lisa: Our tickets are £8 full price this year, half price for cosplayers and under-12s are free. For this price you get to spend the whole day listening to various talks and have the chance to take part in workshops, watch screenings, meet artists and writers and ask for sketches. It is a tough call trying to keep prices low. venue costs can be really high. There are also lots of hidden costs such as insurance and trading licence, the stage, tables. Running a convention can end up being very pricey. When dealing with ticket prices you need to look at your own costs and what your competition is charging. downthetubes: How much are exhibitor tables for Thought Bubble (if you have any)? Again, how did you arrive at that figure? Lisa: Again, we try and keep this low where possible, especially for small press as most of the time they end up losing money attending cons. Our small press and professional tables are £40, retailer and publisher tables are £60. downthetubes: Do you run workshops/events/panels at Thought Bubble? Please tell us about those and how they are organised. Lisa: Most or our programme is full of free workshops for young people and adults, our Arts Council funding helps us to do this. We invite industry professionals to come along and let people know how they write or draw and how to get in to the business. Our workshops have been incredibly successful, with most of them selling out before our brochure comes out. So far workshops have been run on a voluntary basis by industry professionals who are kind enough to give us and the public their time. downthetubes: As you’ve been kind enough to answer these questions, please fell free to big Thought Bubble up a bit. Tell us what you do well, what Thought Bubble's main attractions are and why our readers should attend the next one. Lisa: This year, Thought Bubble will include art and writing based workshops for young people and adults, panels and talks lead by industry professionals and a programme of sequential art related film screenings. The special one-day convention includes an incredible line up of leading artists and writers, and over 150 tables selling comics and merchandise. The day will also feature portfolio viewings and competitions. This promises to be one of the best events of its kind in the UK, where you’ll be able to meet some of your favourite comic book creators and browse the huge selection of memorabilia on sale - brought to you by the biggest and best exhibitors and dealers from across the country. Keep an eye on this website for more updates, or join us on MySpace or Facebook to share your thoughts and ideas! downthetubes: Thanks to Lisa for his time answering our questions. Check out their blog, by the way, for some brilliant comic creator interviews with the likes of Frank Quitely and Charlie Adlard! • Thought Bubble Official Site: www.thoughtbubblefestival.com. Full details as to this year’s programme can be found on the Festival Information 2009 page, while Thought Bubble’s guest list also looks amazing and they have some brilliant small press exhibitors in attendance. Comics writer and former 2000AD editor Andy Diggle will be one of two keynote speakers at an academic conference that will include discussions on the comic form at Lancaster University next year. Together with Professor Terry Eagleton of Lancaster University, he'll be discussing comics at Fractured Images, Broken Words, a postgraduate conference at the University on 12th June 2010 which will also feature art installation by Christine Dawson. Visual and multi-modal texts are an integral element of both popular and literary culture, contemporary and past and the conference is inviting papers which engage with the notion of text and image, through, for example critical examination of graphic novels, television, film, illustrated texts or adaptations. Papers with an interdisciplinary approach are being actively welcomed, allowing for a collision of meaning and interpretations of both text and image. The organisers are particularly interested in – but not limiting the remit to – topics which focus on the fusion of word and image, and perhaps on the gaps which can be perceived between, and within, visual and textual representation. Where do textual spaces exist? Where do word and image meet? Where do they separate? Where does meaning fuse? Where does it disintegrate? "As the conference title suggests, we’re also interested in the duplicitous and unstable nature of texts and images," say the organisers, "and would also like to explore issues such as: How words and / or images be misappropriated, misused or misdirected to create alternative and divergent meanings; The fragility of meaning created by words and / or images; Problems of reading and interpretation." It's hoped the conference will provide a stimulating environment for postgraduate students and other researchers to present work and to share and discuss ideas stemming from the examination of texts employing varied representational modes, adaptations and interactions between text and image. "We hope to encourage speakers from multiple disciplines, working across historical, cultural and literary periods, and with a wide range of texts. Suggested topics, themes and disciplinary approaches include Film, Cultural and Literary Studies, Language, Propaganda Texts, Journalism / Photo Journalism, Graphic Novels and Picture Books, Children and Young Adult Literature, Television, Identity, Ownership of Truth, Authenticity, Biographical Texts, Gender, Ethnicity, Sexuality, Translation, Gaps and Silences and Absences – or any other topic which the conference title inspires. Abstracts of no more than 300 words for papers not exceeding 20 minutes should be submitted by 15th February 2010, to the organisers at: conference@lancasterluminary.com. Please include the title of your paper, your name, e-mail address, institutional affiliation, and a brief summary of your research interests. Intrepid reporters Fred "Ferret" McGlone, Harry Hornby et al − are back in the thick of the action! This time the Headline Heroes find themselves slap bang in the middle of the first Sino-Japanese War of 1894. It’s dicey work and they’ll have to keep their wits about them to survive. This is the second instalment of a four-part mini-series featuring the Headline Heroes – there are stories to come in December and January. At the height of the Korean War in 1951, new recruit Gary “Jonesy” Jones was hailed a hero when his instinctive act of bravery saved the life of a high-ranking Allied officer. Jonesy gained the respect of his comrades. However, he also gained an enemy, his spiteful lieutenant. Driven by jealousy, the officer hatched a plan to break Jonesy…and his squad if need be! Bored with paperwork and traffic duties, Lance-Corporal Jack Johnston of the Royal Military Police was on the lookout for excitement. So he volunteered for special duties and, after a spell of tough training, became a member of the elite Close Protection Squads. That was when he began to understand what real excitement was! Leeds comics event Thought Bubble, which takes place this coming weekend, has just announced several free workshops for children and adults run by industry professionals. If you or anyone you know wants to come along for some comic art and writing fun just sign up! Famous for his work on The Wachowski Brothers' Shaolin Cowboy, and Judge Death, Peter will take participants through the stages of how to digitally colour line art in photoshop. A basic understanding of photoshop is required. Places are limited, book soon to avoid disappointment. Award-winning artist, curator, and academic Sarah Lightman, who trained at 'Slade School of Art', will go through the stages of creating your very own publication. She will explain how young people can use the comic format to reflect their own feelings and experiences. Places are limited, book soon to avoid disappointment. Yishan Studio Shojo Manga Workshop with Yishan Li. 14:30-15:30, Leeds Central Library, 7-12 year olds, FREE. Yishan Li, a leading manga artist, and creator of the Yishan Studio 'How To Draw Manga' books, will run this fun workshop for younger children. Yishan will take them through the steps of how to create characters and figures. Steve Beaumont, character design and storyboard artist, will look at how the two are produced within the video games industry. There will be an opportunity to work from a typical client brief to create a gaming character. Steve will also touch on what the gaming industry looks for to give you a heads up in this ever growing field. Manga Character Art Workshop with Emma Vieceli. 14:50-15:50, Leeds Central Library, 12-18 year olds, FREE. Sweatdrop Studios' Emma, is well known for her presenting on Anime Network, and her fantastic art on the Manga Shakespeare series. In this session, Emma will demonstrate techniques used in manga styled pages and show participants the foundations needed to create their own characters. This workshop will be fun and informal. Frank Quitely Art Masterclass. 15:15-16:45, Carriageworks, 16+, £5 Entry. Young People's Comics Writing Masterclass with Adam Lowe. 16:00-17:00, Leeds Central Library, 12-18 year olds, FREE. Local author Adam Lowe's first novel, Troglodyte Rose, mixes sequential art and prose. In this workshop for young people, he gives tips on writing scripts for comics, including dialogue, pace, and visual cues in this fun and informal masterclass. • We'll have a fab behind-the-scenes feature by Matthew Badham on the Thought Bubble event here on downthetubes on Wednesday, with info on how it's put together and more! Fab Scottish comics convention Hi-Ex has just secured local council funding for its next gathering in 2010. BBC News reports the Highland Council has offered funding for the outreach programme which would see artists and writers hold workshops in schools - the first time the event has secured funding from Highland Council and a great boost for all the hard work organisers Vicky Stonebridge and Richmond Clements have been putting into the convention and their work promoting comics. In order to try and get more zines, comics and self published material out to a wider audience, Britain's Alternative Press team are teaming up with like-minded events organisers to ensure they have a table for the sale of zines and comics etc., making it "Zine Friendly". One of the first of these alliances takes place next weekend with the AntiFolk UK Autumn Festival (Friday 20th – Saturday 21st November) in London's Soho, an evening of music from the Anti-Folk UK collective. A zine friendly event, Alternative Press will have a table or two to sell zines and comix. Also, self publishers who come to sell will receive a discount of £2 off daily ticket price (so, £4 rather than £6). Plus, who could miss comic creato Jimi Gherkin playing some sounds, along with the Tuscan Troubadour, Trent Miller and The Skeleton Jive? Norway sends us Nemi (published daily in The Metro and compiled annually by Titan) and in return we now send them Commando. 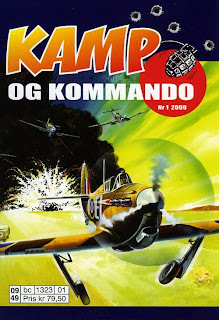 DC Thomson's official CommandoMag site is reporting that Commando comics are being published in Norway by Egmont Serieforlaget with each issue of the new Kamp Og Kommando (Action and Commando) digest including four translated issues of British Commando. This is not the first time that Commando has been published in Norway as translated Commandos were originally published in the digest Kamp. The cover for Kamp Og Kommando issue 1 is from Commando issue 46, Phantom Fighters, originally published in the UK in December 1962 with script and internal art by Peter Ford and cover art by Ken Barr. This story has already been published in Norwegian by Kamp as Fantom Jagerne. Elsewhere in Scandinavia, Finland continues to publish Commando stories in Korkeajannitys, which translates as High Voltage. More details of Kamp Og Kommando are available on the CommandoMag website. More covers of Kamp and Korkeajannitys are available at the Where Eagles Dare website. Returning to the English speaking world and the Tainted Archive blog has a new interview with Commando editor Calum Laird and writer David Whitehead. In the interview they talk about their work on Commando and speculate on exactly why the 48 year old title continues to be successful. • Read the Tainted Archive interview here. • Read the downthetubes interview with Calum Laird here. Finally back on CommandoMag, and the site gives us a preview of the title page of artist Jose Maria Jorge's latest Commando work. The issue, written by Steve Coombes, is due for release next Spring and has the working title of Crossed Sword Squadron. Jorge's reputation of being the best regular Commando artist is well displayed in his typically accurate art of three Second World War RAF Tempest fighters flown by Polish pilots. 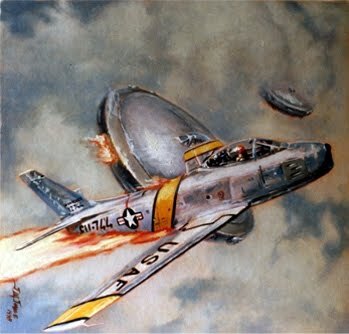 Rather than spoil CommandoMag's preview by reprinting it here we will leave you instead with the the cover of Commando issue 3177, Fatal Contact, showing Jorge's original art for an American Sabre jet's encounter with two flying saucers - one of a wide selection of Commando cover paintings available on his website. • See the Commando artwork preview here. • More details of Jose Maria Jorge can be found on his website.